On April 4-5, 2008, James Madison University and Eastern Mennonite University hosted the Spring 2008 MD-DC-VA Section Meeting of the MAA. On Friday evening at Eastern Mennonite University Carolyn Yackel of Mercer University gave a workshop entitled Math Meets Reality-Realizing Some Mathematical Ideas in Knitting. Elizabeth Theta Brown of James Madison University gave the Mid-Banquet slideshow and Art Benjamin of Harvey Mudd College delivered the banquet address Mathemagics! On Saturday, at James Madison University, Art Benjamin talked on Combinatorial Trigonometry (and a method to DIE for). 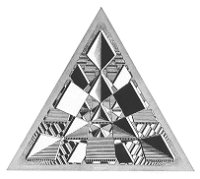 That afternoon Susan Goldstine from St. Mary's College of Maryland will be giving a talk entitled The Geometries of Escher. 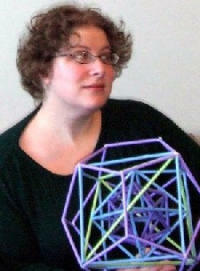 Judy Townsend exhibited her work entitled Organic Geometry. Congratulations to Bruce Torrence of Randolph-Macon College, the 2008 recipient of the John Smith Award for Distinguished College or University Teaching. Our annual Undergraduate Student Conference was well attended, featuring student paper and poster sessions and a Jeopardy competition hosted by Bud Brown of Virginia Tech. Abstract: Beginning with an abstract mathematical myth of octagonal pants and paper manipulatives, we go through stages of mathematical formalization followed by translation to a knitting pattern that allows us to demystify the myth and understand it as fact. In the process we develop an infinite number of knitting patterns for hyperbolic space and for pants of various dimensions. As time allows, other topics may be discussed. 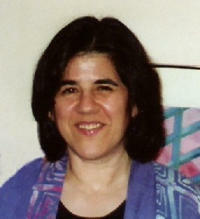 Biographical Sketch: Carolyn Yackel was educated at the University of Chicago (S.B.) and at the University of Michigan (M.S., Ph.D.), where she trained as a commutative algebraist. She's now an associate professor at Mercer University, where she studies the implications of mathematics for fiber arts and vice versa--an emerging field usually referred to as math and fiber arts. This subject brings her much joy as it marries her two loves. She enjoys working both alone and with her major collaborator, Sarah Marie Belcastro, with whom she recently edited their first book, Making Mathematics with Needlework. Abstract: Dr. Arthur Benjamin is a mathematician and a magician. In his entertaining and fast-paced performance, he will demonstrate and explain how to mentally add and multiply numbers faster than a calculator, how to memorize 100 digits of pi, how to figure out the day of the week of any date in history, and other amazing feats of mind. He has presented his mixture of math and magic to audiences all over the world. Abstract: Many trigonometric identities, including the Pythagorean theorem, have combinatorial proofs. Furthermore, some combinatorial problems have trigonometric solutions. All of these problems can be reduced to alternating sums, and are attacked by a technique we call D.I.E. (Description, Involution, Exception). This technique offers new insights to identities involving binomial coefficients, Fibonacci numbers, derangements, zig-zag permutations, and Chebyshev polynomials. Biographical Sketch: Arthur Benjamin earned his B.S. in Applied Mathematics from Carnegie Mellon and his PhD in Mathematical Sciences from Johns Hopkins. 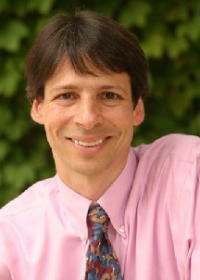 Since 1989, he has taught at Harvey Mudd College, where he is Professor of Mathematics and past Chair. In 2000, he received the Haimo Award for Distinguished Teaching by the Mathematical Association of America. Currently, he serves as the MAA's Polya Lecturer from 2006 to 2008. His research interests include combinatorics and number theory, with a special fondness for Fibonacci numbers. Many of these ideas appear in his book (co-authored with Jennifer Quinn), "Proofs That Really Count: The Art of Combinatorial Proof", published by MAA. In 2006, that book received the Beckenbach Book Prize by the MAA. Professors Benjamin and Quinn are the editors of Math Horizons magazine, published by MAA. 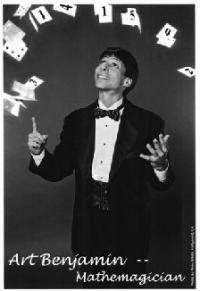 Art is also a magician who performs his mixture of math and magic to audiences all over the world, including the Magic Castle in Hollywood. He has demonstrated and explained his calculating talents in his book "Secrets of Mental Math" and on numerous television and radio programs, including The Today Show, CNN, and National Public Radio. He has been featured in Scientific American, Omni, Discover, People, Esquire, New York Times, Los Angeles Times, and Reader's Digest. In 2005, Reader's Digest called him "America's Best Math Whiz." Abstract: A recurrent theme in the intoxicating images of M.C. Escher is the division of the plane into animal figures. Underlying each division is a tiling of the plane by simple polygons. Escher's spirit of artistic adventure led him to explore more exotic patterns, and we will follow his path into tilings of the sphere and of the hyperbolic plane. Biographical Sketch: Susan Goldstine received her A.B. in Mathematics and French from Amherst College in 1993 and her Ph.D. in Mathematics from Harvard University in 1998. When she is not doing research in number theory and algebraic dynamics, she enjoys making tactile and visual mathematical models employing such diverse media as yarn, fabric, thread, glass beads, paper, steel wire, copper tubes, pinecones, and pottery, though not all at once. Some of this work can be seen at http://faculty.smcm.edu/sgoldstine. She is also an avid cook, and while she usually pursues non-mathematical cookery, she hopes one day to reproduce the interlocking Escher swan cookies she made for a lark as an undergraduate. Her institutional home is St. Mary's College of Maryland, where she strives to maintain her reputation for having the office with the most toys. Abstract: We present selected images from the field of mathematical visual art, including art influenced by mathematics and mathematical notions instantiated in an artistic way. 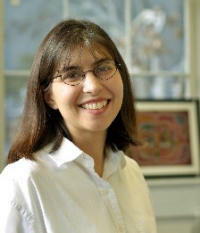 Biographical Sketch: Elizabeth Brown came to James Madison University following a postdoctoral appointment as John Wesley Young Research Instructor at Dartmouth College and graduate work at Boston University. Her mathematical research is in set theory. Her other academic interests include the teacher training of mathematics graduate students for college and university careers, the philosophy of mathematics and science, and mathematics in fine and performance art. Before discovering the joys of mathematics, she studied epistemology in the context of analytic philosophy for a first Master's. She is a 2002-3 Project NExT fellow. She has the dubious honor of being a winner of the 2007 JMU Mathematics and Statistics Department Pi Day contest (held on March 14 at 1:59), in which students donate money to a charitable cause in order to be able to throw pies at the top faculty earners. Abstract: I have chosen to work with mathematical themes in my watercolor paintings as a way of expressing the timeless beauty of the universe around us. That the universe can have structure and order, and at the same time be evolving through chaos and entropy inspires my imagination. Biographical Sketch: Judith Townsend’s artistic life began with original contemporary quilted wall hangings. Feeling limited by the time involved in creating quilts by hand, she explored other mediums and found watercolor especially suited to the ideas she wanted to express. The paintings can be described as structured abstracts which are inspired by discoveries in science, the elegance of pure mathematics, and the rhythms of nature. She often employs a grid which can be perceived as an obstacle to clear vision or a window through which reality is revealed. In the grid structure can be seen the watercolor paintings’ evolution from quilts. Originally from New England, Judith has lived in Advance Mills, Virginia since 1984. She graduated from Windham College in Putney, Vermont (where she studied mathematics with Robert Lewand), and received her master’s in elementary education from Antioch New England. She has worked in the field of alternative energy, taught in a three-room school in Marlboro, Vermont and served as executive director of the Charlottesville-Albemarle (Virginia) Clean Community Commission.